You can create a custom WordPress template for a page, post, or custom post type and make it appear in the Template dropdown list on page, post, or custom post type editing screens. Tip: Singular templates that you create with Beaver Themer use a slightly different procedure. See the article on adding a Singular theme layout to the Template field. However, you can treat them like other WordPress page templates and add them to the Template dropdown list with a bit of PHP code. You can add the choice to Pages only, Posts only, or both. In this example, we'll add a custom page template called Landing page to the Template field for Pages, as shown in the following screenshot. This procedure requires that you have a child theme installed, so your changes don't get overwritten with theme updates. Create your custom page template. You can start from scratch, or you can copy page.php from the main theme to the child theme. Name your custom template file page-<my-custom-page-template>.php, where <my-custom-page-template> is any name for the template that is meaningful to you. 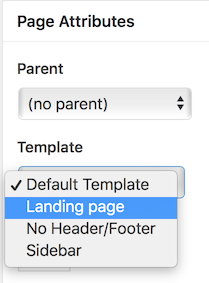 In Line 3, the template name Landing page will appear as the value in the Template dropdown list. Line 4 specifies that this value will only appear for Pages, not for Posts. Save the file and place it in the top-level directory of your child theme on your WordPress site. 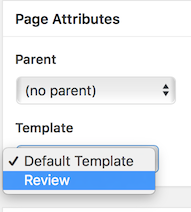 Open a page for editing and check for the name of your template in the Template dropdown list. For single Post pages, copy single.php from your main theme to your child theme and name it simple-<my-custom-post-template>, where <my-custom-post-template> is a meaningful label for your Post template. 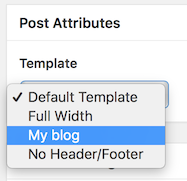 In Line 3, the template name My blog will appear as the value in the Template dropdown list of Posts. Line 4 specifies that this value will only appear for Posts. Open a post for editing and check for the name of your template in the Template dropdown list. Assuming your custom post type is derived from a standard Post page, the procedure is pretty much the same as for standard Posts, but you'll use the slug of the custom post type as the template post type. For example, suppose you have a custom post type for Reviews, and you want to add a template called Review that users can select when they edit that custom post type, as shown in the following screenshot. Find the slug of your custom post type. One way to do this is to view one of the custom post type pages and copy the slug from the URL. Copy single.php from your main theme to your child theme and name it simple-<my-custom-post-type-template>, where <my-custom-post-type-template> is a meaningful label for your Post template. In this case, it could be called simple-review. In Line 3, the template name Review will appear as the value in the Template dropdown list of Posts. Line 4 specifies that this value will only appear for custom posts of type review . Open a post for editing and check for the name of your template in the Template dropdown list. If the Post Attributes panel was not there previously, it should appear when you add this custom file, or you can check in Screen Options to see if the Page attributes field needs to be enabled.